Vasiliy Lomachenko wrecked heavy underdog Anthony Crolla with a brutal KO. Watch the finish here. 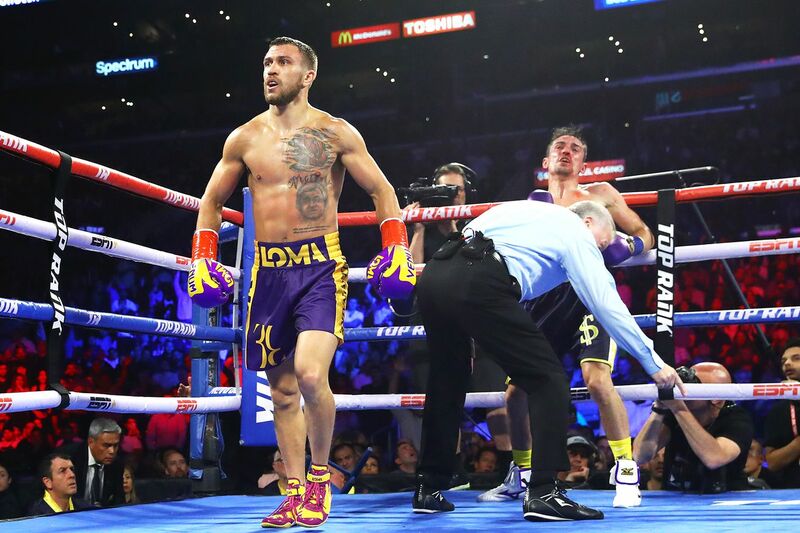 WBA and WBO lightweight champion Vasiliy Lomachenko (13-1, 10 KOs) was rightfully the enormous favorite over England’s Anthony Crolla (34-7-3, 13 KOs) in Friday night’s Top Rank on ESPN+ main event in Los Angeles, California. It’s one thing to be a humongous favorite, it’s another to actually justify such long odds. Needless to say, Lomachenko didn’t waste much time. Lomachenko completely schooled the tough but woefully overmatched former WBA champion, scoring a technical knockdown in round three before an actual KO in round four. It’s only the second time Crolla has ever been stopped, and he just had absolutely nothing for the Ukrainian star. A right hook finished the job as Lomachenko made Crolla fall face-first to the canvas, and there’s no good reason for referee Jack Reiss to have even started a count. Official time, :58 of round four. Considering what Crolla survived several years ago, that made the reaction to the KO extra worrisome, as he had trouble getting onto his stool well after the fight was stopped. Lomachenko wants WBC champion Mikey Garcia next, although he might vacate the title depending on what he wants to do with his career. In which case, he’d likely face Luke Campbell (20-2, 16 KOs) for the vacant title. Another option is IBF champion Richard Commey (28-2, 25 KOs), who was the original opponent for tonight’s card but was forced out with a hand injury. Either Campbell or Commey would be miles better an option than Crolla, who was the WBA mandatory. In case you’re wondering, Lomachenko’s reported guarantee was $3.2 million (official purse $1.2 million), whereas Crolla’s was $300,000, although he probably got more money through Sky Sports in the UK.